HAVE YOUR INSTITUTES FILLED THEIR NEW YEAR CALENDAR OF EVENTS YET? Jill McKay�s Art with Class provides travelling tutor services for the W.I. 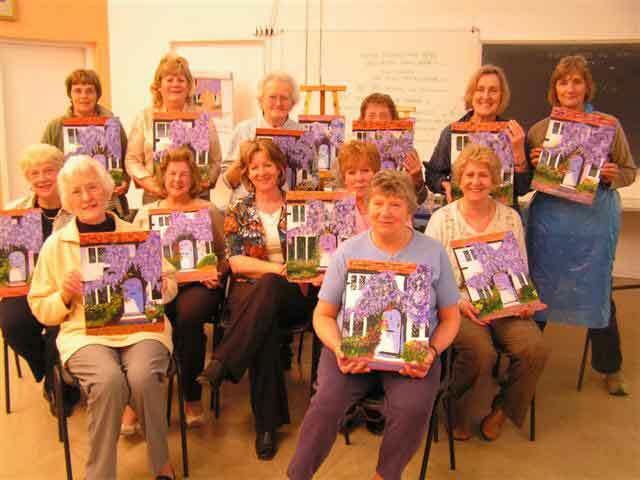 One day or weekend workshops anywhere in the UK and in Ferndown for up to 12 people (larger groups possible with advanced notice), Dorset Experience the �easy way�to draw and paint. For large groups please contact us. Suitable for all from total beginners to experienced artists. Every student returns home with a finished painting or several cameos. �Pen and Wash� �Easy Watercolours� �������.but any combination or subject can be designed for your group. Advanced bookings are currently being taken. If you require larger groups to be taught or for our demonstrations services, please contact us to enable us to source the accommodation to meet the student numbers..
Jill is available during the following periods each year � during the day, evening or weekends - subject to existing courses, workshops and other commitments. Accommodation may be required for evening classes and can be arranged or demonstrations that are over 50 mile radius of Ferndown. Weekend workshops during may can be viewed on Calendar page along with many other events. Summer Places are subject to availablity for a relaxing painting holiday in France . For a leaflet use our CONTACT US page above. We offer a wealth of choices to make your event very special, this can be a workshop, demonstration, talk, interactive event. Do call us for more informations and options. We have no constraints with the exception of current bookings.